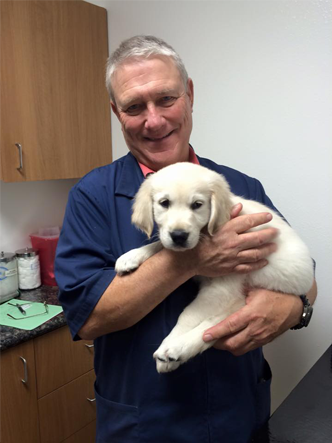 DR. JOHN M. BRASHER has been at Memorial Town & Country Animal Clinic from its inception. His previous practice, Memorial Animal Clinic, stood at the existing site of today's "MTC". Dr. Brasher was born in Weimar, Texas. Even as a small boy in Weimar, he was always intrigued by animals. On more than one occasion, his teacher would request that his mother "try to get your son to leave the critters at home!" This usually meant he had another snake or frog rolled up in his pants cuffs. While attending Texas A&M University, Dr. Brasher was a member of the Corps of Cadets. He continued on to receive his D.V.M. and chose to practice in Houston. (Not much call for frog vets in Weimar!) Now his patients are usually cats and dogs, but if a client has a sick rabbit or gerbil...and we can't forget the duck, "Lucky Clucky", Dr. Brasher is willing to help. Dr. Brasher has many animal-related hobbies and interests. They range from working cows at the family ranch in Columbus, to field trial (a retriever competition) with his Labradors. As the front desk staff has learned, "mark Dr. Brasher out for at least an hour" when a new Labrador pup comes in. Although he has a soft spot for the breed, his menagerie at home includes too many cats to count, chickens, golden retrievers "Sunny "and "Dewey". Dr. Brasher is never too busy to lend a hand, or let them know he cares personally, which is why MTC feels like a family, not just a business. DR. MARK PETERSON is originally from Washington state but after 35 years in Texas, he thinks he's a Texan. He has been in the greater Houston area for the past 30 years and refuses to leave Texas now. He went to Texas A&M as all the best vets did and took special interest in horses and exotics as well as dogs and cats. After school he spent several years working almost exclusively on horses and still enjoys their company (which is a good thing as his wife of 10 years insists they have 1 or 2 at all times). Since then he has spent most of his efforts working with small animals and has studied on the use of ultrasound to diagnose problems and continues to seek more in depth studies in the field. If you have horses feel free to ask questions as he sometimes says he misses them and enjoys a good horse story now and then. His pets include a pomeranian named "Tavi" (you may see him up front occasionally), "Cletus" the Cavalier, and some various...critters. Dr. Edwards, now at the clinic every Tuesday and Thursday, worked as a relief veterinarian for the doctors at MTC starting in 1990. Although not here on a daily basis, Dr. Edwards had become a regular here many Saturdays, as well as off and on when needed while Drs. Brasher and Peterson were away from the clinic. 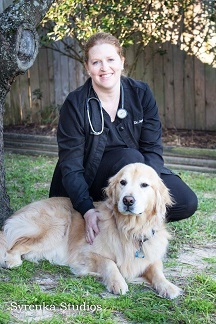 Born & raised in Houston, Dr. Edwards was raised on a farm near the Hobby Airport area. Her family of 10 children had a large vegetable garden, as well as horses, chickens, and the dogs and cats. Dr. Edwards graduated from Texas A&M College of Veterinary Medicine in 1979. She worked in equine medicine in California and Seguine, Texas, before beginning at a small animal emergency clinic in Houston in 1982. Also in 1982, Dr. Edwards began doing relief veterinary work, filling in when other vets had to be away from their practice. Dr. Edwards has four 4-legged children - dogs "Cosmo" and "Eze" and "Skeeter", and cat named "Tag". Because Dr. Edwards worked regularly at various clinics, she was sought by clients in many parts of town. The doctors and staff are fortunate to have Dr. Edwards here as part of our clinic family. Dr. April Inman has been a Veterinarian at MTCAC since 2013. Initially she worked here as a relief doctor but has been here full time since then. She was born and raised in the Texas hill country, just outside New Braunfels, and moved to Houston in 2007, after graduating vet school from Texas A&M University. Experienced in general practice, emergency medicine and exotics, but her passion is in providing: geriatric care, pain management, ultrasound and dentistry. You may see her around at St. Cecilia Catholic School where her husband and mother work and her 2 children, Kylee and Maddie, attend school. Her pet family includes 3 dogs, "George", and "Newman", and 2 cats "Lola" and "Biscuit". When Dr. Inman is in, you will find George, her 6 year old golden retriever, laying behind her desk. He loves to meet and greet new puppies at the clinic and often visits nursing homes and classrooms as a certified pet therapy dog, with the Faithful Paws organization. "Newman", on the other hand, is the opposite of "George". If he is up front with the rest of the gang, he is usually causing chaos. *Update - she has added a new rescue to her mix, "Heidi", a golden retriever. And "Newman", now belongs to receptionist Lee! In her spare time Dr. Inman enjoys playing or watching sports of all kinds, running, and doing just about anything outdoors with the kids.